This article is about the history of the Democratic Republic of the Congo between 1971 and 1997. For the modern country, see Democratic Republic of the Congo. For other uses, see Zaire (disambiguation). "Peace – Justice – Work"
a. Renamed from "Democratic Republic of the Congo" (République démocratique du Congo) on 27 October 1971.
b. Changed from "Léopoldville" in 1966.
c. Zaire became a de jure one-party state on December 23, 1970, but had been a de facto one-party state since May 20, 1967, the date on which the MPR (Mouvement Populaire de la Revolution) was established. Zaire formally adopted a multiparty system on April 24, 1990, when Mobutu delivered a speech proclaiming the end of the one-party system. The country adopted multipartyism de jure with the passage of Law No. 90-002 of July 5, 1990, which amended its constitution accordingly. 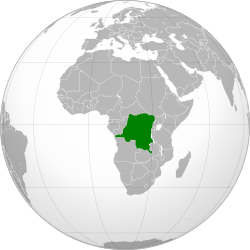 Zaire, officially the Republic of Zaire (French: République du Zaïre) was the name of a country that is now called the Democratic Republic of the Congo. It used this name from 27 November 1971 to 17 May 1997. The name "Zaire" comes from a Portuguese corruption of the Kongo word nzare, meaning "river". ↑ Thomas Turner, "Flying High Above the Toads: Mobutu and Stalemated Democracy", in Political Reform in Francophone Africa (1997), ed. John F. Clark and David E. Gardinier, page 70. ↑ Kaplan, Irving (ed.). Zaire: A Country Study. Third Edition, First Printing. 1979. ↑ Sandra W. Meditz and Tim Merrill (eds.). Zaire: A Country Study. Fourth Edition. 1993. This page was last changed on 31 January 2019, at 01:15.